The digital alarm clock has come a long way since it was first introduced to the market. While initially, it could merely tell the time, with small square numbers flicking over as the minutes went by, it is now an entirely new technology. Not only can a digital alarm clock tell the time, but many of them have all different kinds of new features to make rising out of bed just that little bit less painful. You can plug your phone into them, as many have USB ports, and others are LED, have torches, radio, can be written on with a whiteboard marker, and are even portable to be taken anywhere you go. There are many different options available, including those that allow you to customize the tone, alter the time zone, move around the table, and even provide projection onto ceilings and walls. Whatever type of digital alarm clock you require, there is sure to be one that ticks all the boxes for your requirements. When you’re ready to go shopping, consider any of these nine top-rated options below. This projection digital alarm clock from Mpow is a piece of technology many people would love to get their hands on. 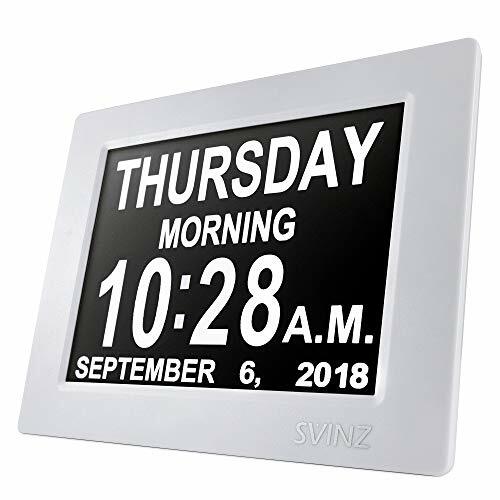 Not only does it show the time on the clock itself, but it can project it onto other surfaces such as ceilings and walls. It has a 1.6 to 10 feet radius, enables you to adjust the brightness, so it doesn’t keep you up at night, and offers many different options for how you wish to wake up as well. You can wake up to a radio station, or a standard digital alarm clock tone. The alarm stays on for five minutes, while the radio and alarm function both get louder the longer they are left untouched. This is a helpful feature for those who just don’t like getting out of bed in the morning without encouragement. What’s more, you will be impressed with the radio clock sleep timer as well. It can store up to 15 different radio stations, has a sleep function so that it will turn off when you’re ready to sleep, and enables you to ease yourself into a deep slumber to whichever station you prefer. As phones make up a large part of our lives, you will also reap the rewards of having an inbuilt USB port. As such, you can charge your phone on a 1.2-amp USB port while you sleep, having it ready to go when you wake up to the alarm in the morning. 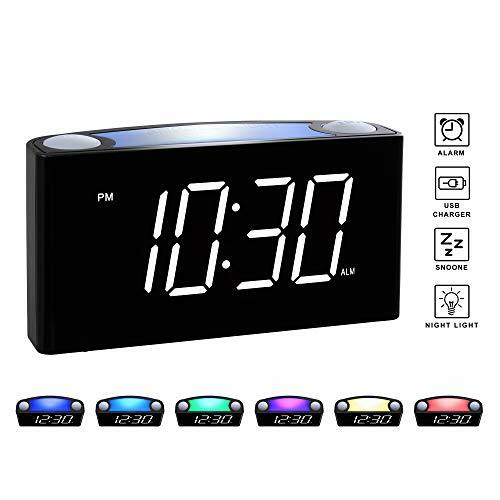 Projection digital alarm clocks are becoming more and more popular, as people require additional encouragement to get up in the morning. This Mesqool clock projects the time onto any surface, with a 180-degree swivel function as well. No matter where you are in your room, you will always know what time it is. For those who want to wake up slowly, without the morning madness, you can choose to listen to a radio station before you rise. With this digital alarm clock, you have the option of setting and saving up to 20 radio stations within the clock’s memory. Therefore, you don’t have to wake up to the squealing of an alarm, instead the gentle tones of the morning weather report. The display is also a point worthy of mention. It features extra large LED white numbers, you can adjust the brightness to low, medium, and high, and can adjust the distance at which it projects on the wall as well. You can also choose whether to wake up to an alarm or radio station, but it won’t be a rude awakening. The audio starts off softly and slowly, allowing you to wake from your deep slumber. It then gets louder and more urgent until you can finally turn it off and prepare for your day. Everything about this alarm clock will appeal to those who just need a bit of encouragement to rise in the morning. If you want your clock to do more than just wake you up, this is the clock for you. A typical digital alarm clock can normally only tell you the time, and whether it’s in the morning or the evening. However, what are you supposed to do if you want to know the month, the day of the week, or even the indoor temperature? Instead of rifling through drawers for thermometers and calendars, you can instead rely on this Ambient Weather alarm clock. Designed to take telling the time one step further, it’s a sought-after clock that’s both functional and affordable. It tells you the time, plays music from the radio, lets you know the month and the day of the week, and even tells you what temperature it is in your bedroom. What’s more, it then projects this information onto your ceiling or walls with 180-degree viewing. However, the features don’t end there. How are you supposed to set the clock without knowing the time? With this digital alarm clock, you don’t have to. As it has an atomic clock, this clock will automatically detect the time, month, and date, through radio signals. It’s even in sync with the US atomic clock for 100 percent accuracy. If your day relies on precision, start it off on the right foot with this digital alarm clock from Ambient Weather. 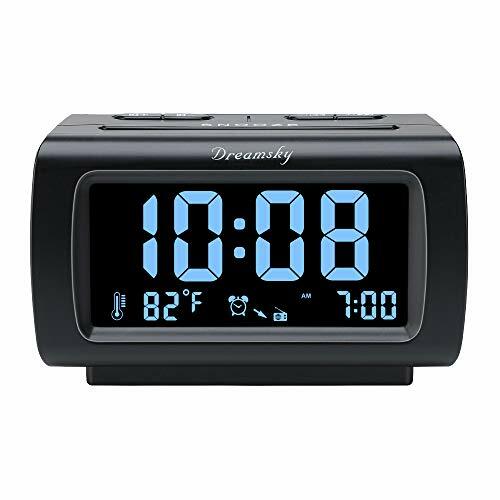 There are so many different digital alarm clocks on the market, and while all of them may do what they’re supposed to, they may not tie into your home décor. Now more than ever, people are paying attention to what’s on trend, what’s simple, and what helps them to stand out from the crowd. All those boxes are ticked with this LED alarm clock. 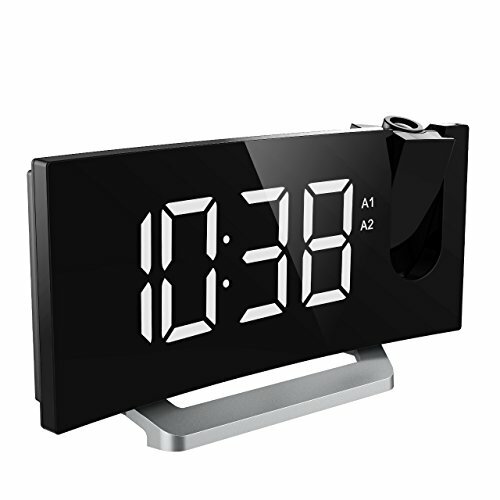 Seamless in design, it’s a straightforward yet sturdy digital alarm clock that provides no end of convenience. It has large LED white digital numbers to make it easy to read at any time of the day or night, as well as a straightforward snooze button and no technical buttons on the front you might hit by mistake. You can dim the LED digits if they’re too bright, and you can even turn down the alarm sound if it’s too noisy for first thing in the morning. What’s more, it comes with a dual USB port for your convenience. If you have any USB powered devices, you can plug them in before you go to sleep, and wake up to them fully charged and ready to go. A major inconvenience for many digital alarm clock users is a power outage. You then have to find out what the time is and re-enter it back into the clock. With this clock, just add a battery, and enjoy the peace of mind that if the power cuts out, the battery will save your settings. Easy to set, easy to use, and a beautiful clock to have beside your bed, there’s every reason to consider buying it today. Not every bedroom or area in your home is going to have enough power plugs to charge all your devices, but what if your digital alarm clock could solve that problem? If there are no plugs near your bed, yet you need to charge your devices, this Beare Alarm Clock Charging Station has you covered. Not only is it a functioning alarm clock to see you get to work on time, but it has four charging ports of various amp ratings to ensure your phones and media devices are ready to go when you are. It also has easy-to-read LED digits, the brightness can be adjusted, and it has seven pre-programmed timezones. As a result, you can see what time it is in other parts of the country, as well as in daylight saving time mode. When it comes to getting out of bed in the morning, this digital alarm clock makes it simple. It has both a gradual wake alarm and a snooze option and gives you nine minutes of peace before it will go off again. You can also opt for a snooze time of up to one hour. In case of power loss, you won’t have to worry about losing the time you’ve set. 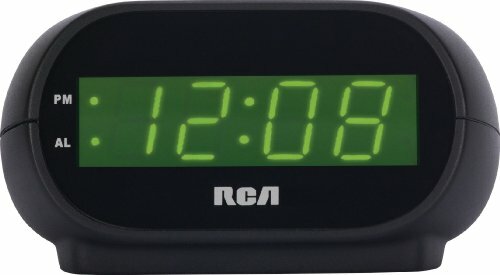 This digital alarm clock has one pre-installed battery which makes sure that everything you’ve saved on this clock will not be lost as a result of the power being off. If you want a clock that ticks all the boxes for functionality, then consider this alarm clock charging station from Beare. Not every digital alarm clock has to be big and cumbersome to get the job done, and this small CubieBlue from BrandStand proves it. Bucking the trend by being manufactured in a cube shape, it’s a little, lightweight and compact digital alarm clock that has a myriad of functions. It can tell the time, wake you from your deep slumber, but can also be used as a Bluetooth speaker as well. Just link any Android or iOS device to it and listen to your music as you fall asleep. What’s more, you can also use it to charge your devices. It has two in-built USB ports, enabling your phone or another USB device to charge while you get some much-needed shuteye. Safety-wise, this digital alarm clock more than meets the mark. It has been spill-tested, and it also has surge protection as well. While it looks small in size, it’s big on functionality, durability, and robustness. If you want your alarm clock to be more than just a time-teller, consider purchasing this CubieBlue alarm clock from BrandStand. 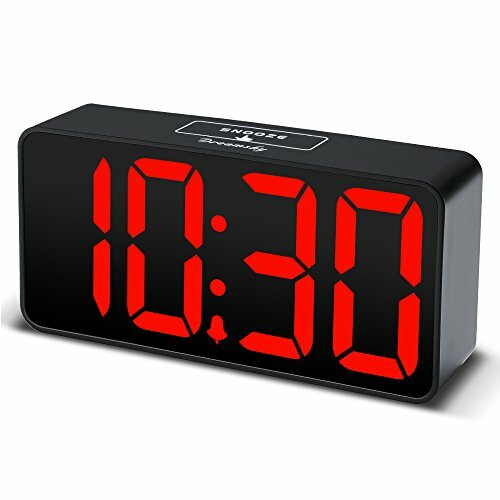 Available in black and red, black, gray, white, and cocoa, this is a digital alarm clock that is taking the market by storm. Not only is it a time-teller – proving convenient when you need to get to work on time, but it’s also a sleek, modern clock that suits any décor in any home just beautifully. It has a bright, vibrant LED display – with the digits a different color depending on the exterior color you choose to buy – and you can select different dim rates to suit your eyes. If the bright light is keeping you awake, merely dull them back to the lowest setting and sleep peacefully. 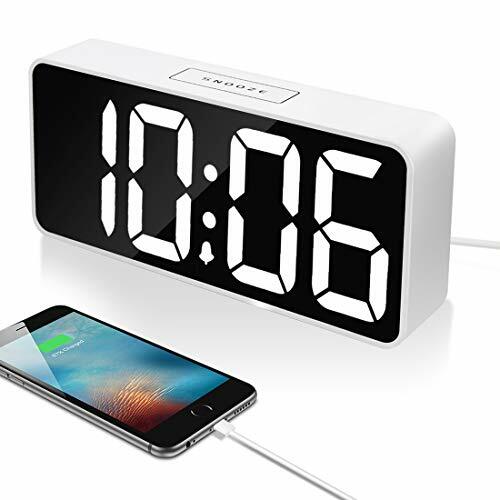 For charging your other devices at night, such as cell phones, this digital alarm clock has you covered. It features two fast-charge ports that enable you to wake up to a fully charged phone. What’s more how it functions as an alarm clock will ensure you always get to work on time. It’s easy to set, has a consistent alarm tone, and has a snooze function which goes off every five minutes. When you need a new alarm clock but want one that looks stunning on display, consider a Marathon alarm clock. If you’re tired of the same old traditional digital alarm clock, it might be time to step it up a notch with this very functional Marathon USB clock. With over 256 display colors to choose from on three dimmer settings, there’s an element of fun to what is otherwise a boring device. It also has two USB ports for charging your phones and devices, as well as many different display modes. What sets this digital alarm clock apart from many others is how functional is. Not only can it tell the time, but it can tell it in 24-hour time, offers indoor temperatures in Celsius or Fahrenheit and even displays the day of the week in five different languages. The sky’s the limit for what this clock can do. It also has the ever-popular snooze function and includes three AAA batteries for backup if the power goes up. Everything has been thought of, so if you’re after a functional digital alarm clock that’s both fun and functional, this Marathon clock should be on your wish list. In this day and age, everything is multi-functional, and a simple digital alarm clock is no exception. 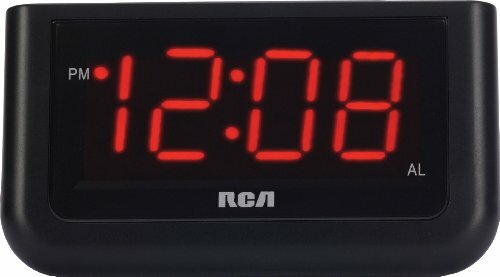 Why have a clock that can just tell the time when you can have one that plays songs, charges devices, takes phone calls and has Bluetooth? There’s very little this digital alarm clock can’t do for the user. 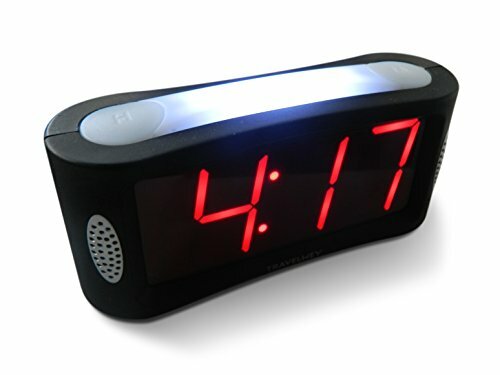 What helps this alarm clock to also stand out from the crowd is how different it acts, looks, and operates. It has a built-in Apple Lightning Dock, can both charge and play music on your phone simultaneously, and even comes with two charging ports for non-Apple devices as well. You are also sure to love the radio functionality, the 30-inbuilt radio channels, hands-free calling, and the large LCD display. What’s more, it even comes with a remote control, an instant time setter, and both Bluetooth and NFC functions. While it’s an alarm clock that can help you to rise with ease in the morning, it’s also so much more. This alarm clock is the crème de la crème of all alarm clocks on the market.